I'm a native Venetian born and raised (30 years) but I moved in the US 18 years ago. I'm going back for a month in August and tried to figure out the usual ridiculous ACTV tickets drama (Carta Venezia then iMOB now what? 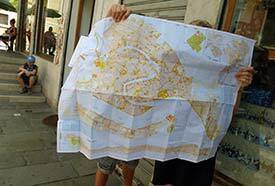 Carta or Tessera Venezia Unica? OMG! Well I spent all day trying to get proper info via the "Official" Web site (ACTV, Venezia Unica) and did not find any clear info about this new Card. Finally I found it! Where? Well on your Web Site! (Thanks to Google). The ACTV should link your web site to theirs! How ironic is that a Venetian has to find on a Web Site for tourists the info needed for Venetians! From now on before I go back home...I'll make sure I check your web site! As a regular visitor to Venice (from UK) I just wanted to say THANKS to the Imbodens for your brilliant, streetwise advice on getting around and making the best use of this beautiful, if complex and challenging city. It is the best online source of spot-on advice I have seen for any city anywhere--well done, and thanks again! I'm preparing for my third trip to Venice, and stumbled upon your site reading about gondolas--finally going to spring for it ;o). I have been to Venice before but your site is FLIPPIN' AWESOME! SOOOOOOOOOOOO much practical information in an understandable presentation. Love you guys. I'm going to tell everyone I know about your site! Just wanted to drop you a note of thanks for your wonderful site! We will be leaving Sunday for our honeymoon and I knew to anticipate things like carrying bags long distances. But you had several tips that were very useful, including how to take the bus from the airport to Piazzale Roma. Believe it or not, I had a great deal of trouble figuring that out until I found your site! Thank you so much for sharing your wealth of knowledge about Venice. I cannot wait to be there! My husband and I want to thank you for your great help in planning our 7-day trip to Venice through Venice for Visitors. Before leaving Montreal, we read your articles, #1 warning, Venice travel blog, etc. We also appreciated the short videos. With your advice we think we have been acting like a local! We really enjoyed our stay and expect to return to Venice next June. We are frequent Venezia visitors. A friend asked for a short guide to visit Venezia in 5 days (not so bad). Just a quick note of appreciation: our family is planning to visit Venice in early January 2013 and as we hunted the net this morning we stumbled into your cornucopia of a site. Thank you thank you thank you. We are going to become avid readers over the coming months. Thank you for preparing answers to so many of the questions that we hadn't even realized we needed to ask! Warmest thanks for all of the information you provided regarding Venice! I just wanted to send a note to thank you for the superior detail that assisted me so greatly with our pre- cruise planning. The Hotel Olimpia was perfect as were all of the other pages of info you detail. How fortunate that I stumbled onto your site!! Thank you for the "How to Buy an Imob.Venezia Card" article!....If I was a better swimmer, I could probably have saved money by swimming, but since I'm not, I am very happy to have the imob card. You saved me a boat-load of money, pun intended! Thanks for a great website that has been very helpful while planning my six-week stay here. Just a short note of thanks for your wonderful, informative web site on Venice. We have just led a tour group (our third) through Israel and chose, Athens, Rome and Venice as a 'bolt on' extension tour. Our tour group have now departed home to Australia and my wife and I are staying on at the Delfino Hotel in Mestre. Your site info has helped me confirm the exact location to pick up our HAL cruise in a few days time and to plan our exploration of Mestre this afternoon. Thank you both for having blessed my wife and me on what is to be our pre-retirement holiday. Iwould like to commend you on an excellent, informative, well-constructed and easy-to-naigate site. It is most comprehensive and I have found it most helpful in planning our upcoming stay in Venice and our following departure on a cruise. I don't know you are or where you are, but your Web site is by far and away the best for planning a trip to Venice. The #1 best recommendation by far was to stay in Mestre at the Plaza Hotel. It fit our needs perfectly because we arrived by train and had to leave for a very early flight at Marco Polo airport yesterday morning. It was great walking across the street to our hotel, which was truly four stars in every way -- especially the massive and high-quality buffet breakfast. We walked two blocks at 5 a.m. yesterday to the airport bus, and it all worked. Going to Venice every day took 10 minutes on a multitude of regional trains for only 1.20 Euro each way. And you were right about these Mestre hotels costing half of comparable hotels in Venice. We sat next to a couple on our flight that stayed near the Academia, booked by a travel agent. Their three-star hotel was old, threadbare and had a poor breakfast -- all for 275 Euros per room per night. When it really poured one morning, they saw many travelers getting off the Vaporetto and slogging through blocks with six to eight inches of standing water, wheeling their suitcases right through the water. Wow. Thanks again for all. We're recommending your website to others. I ought to mention that the best resource for Venice anywhere on the Web is 'Venice for Visitors.' It's comprehensive and it's very, very good. One of my favorite pastimes is to review websites on Florence and Venice. My husband and I go there now every September and stay for a month. I like to make comments on TripAdvisor (positive rather than negative), and I have recommended your website many times. You both have done an excellent job of explaining how to navigate, and I just wanted to relay that to you. We have several friehnds that are now making those two cities a priority and call me for suggestions. Invariably your website is recommended. Venice travel can be daunting, and your explanation is so clear.